Powerful list and combo boxes have always been an important part of Access as Andy Baron shows in this article. This article uses SQL Server as a back-end. Combo and list boxes have always been very full-featured in Access. Access developers take for granted capabilities like multiple columns and having control over combo box list width, which are unavailable in other development environments (unless you buy third-party controls or perform fancy API tricks). Not much has changed in the Access versions of these controls over the years, other than the addition of the Dropdown method for combo boxes—until now, that is! 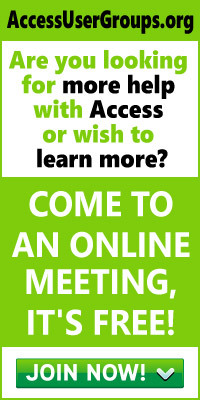 Access 2002 offers important new ways to populate your list controls. The list-filling techniques discussed in this article are all alternatives to using queries based on persistent connections to your data. By reducing persistent connections, you improve your application’s scalability. However, increasing scalability, as in these examples, is only one reason to use these techniques. They’re also handy if you want to list items, like files or printer names, that aren’t stored in a database. Without these techniques, you’d need to dump the data into a table and use a query based on that table as the row source of your list control, or use complex callback functions. The sample application that accompanies this article contains a form with several examples of combo and list boxes that demonstrate the list-filling capabilities of Access 2002 (see Figure 1). The sample application gets its data by opening ADO recordsets against the SQL Server Northwind database. To establish a connection to the database, the code uses the accompanying Data Link file, Northwind.UDL. You can adjust the connection properties by double-clicking on this file and using the dialog box shown in Figure 2. 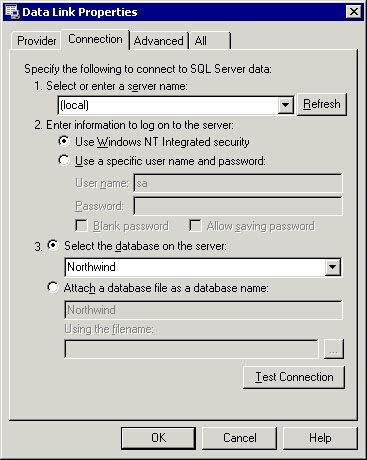 If necessary, you can even change the connection to use the Jet provider and to point to Northwind.mdb, instead of using SQL Server. The recordsets in the sample code use client-side cursors, and their connections to the database are closed immediately after the data is retrieved. The sample application doesn’t maintain any persistent connections to the database, increasing scalability. These “disconnected” list-filling techniques are useful in n-tier applications where data is supplied by middle-tier objects. If that data is packaged as ADO recordsets, then you can use code very similar to the sample code in this application. You’ll also see an example of using XML data to create an ADO recordset. You’re not required to rely on recordsets—you could use the MSXML parser, for example, to fill lists from XML data without using ADO recordsets at all. To do that, you’d use a value list as your row source type. 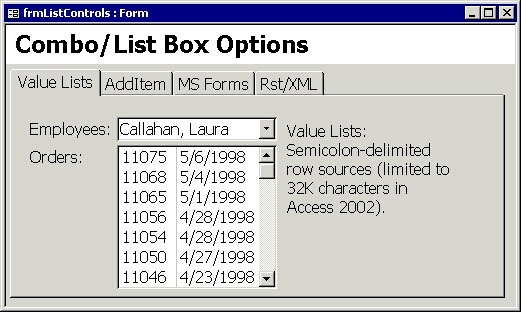 Value lists are much improved in Access 2002. As in prior versions of Access, you can populate combo and list boxes programmatically or in design view by setting the RowSourceType to “Value List” and assigning a delimited list of string values to the RowSource property. For example, you might assign “Male;Female” to the row source of a combo box used for entering a person’s gender. However, in previous versions of Access, this technique could only be used for very short lists, because the RowSource property was limited to strings containing a maximum of 2,048 characters. In Access 2002, that maximum has been increased to 32,768 (32K). This makes value lists much more practical, and, as a side benefit, it also enables you to use more complex SQL strings as row sources. To create multicolumn controls based on value lists, set the number of columns in the control’s Column Count property, and add a semicolon or comma delimiter between data for each column. For example, if you want to use a code of 1 for Male and 2 for Female, enter the values shown in Table 1 for the control’s properties. Table 1. Sample values for a value list. You can use either semicolons or commas to delimit the list, or a combination of the two. If you use commas in the property window, Access will convert them to semicolons. However, when assigning a value list row source in code, you can use either or both characters. MsgBox "Couldn't connect to Northwind"
" ORDER BY OrderDate DESC"
Using GetString is, of course, only one of many possible ways to construct a value list. If you’re working with XML data, you could even create an XSL stylesheet that would transform an XML document into a delimited string suitable for use as a value list. In addition, Access 2002 provides two new methods for adding and removing items from value lists. 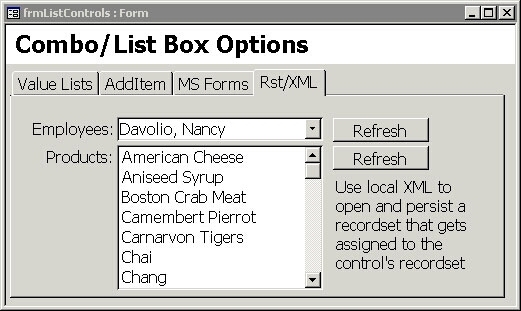 If you’ve used Visual Basic forms or the forms package that’s used with VBA in Word and Excel, then you’ve probably used the AddItem method to populate combo and list boxes. Access 2002 introduces AddItem and RemoveItem methods that are implemented as wrappers around value lists. To use these methods in Access, your combo or list box must have a Row Source Type of Value List, and these new methods simply append or remove items from the value list string. You still need to add extra quotes if your values might contain commas or semicolons, and you need to add a delimited set of values for each item if you need multiple columns. In other words, all AddItem does is append a string to the existing value list string. The RemoveItem method isn’t used in the sample application. RemoveItem enables you to delete a section of your value list by specifying the zero-based row index or the value in the bound column of that row. This is a bit handier than AddItem, because the code to do this manually would be a bit trickier to write. Unfortunately, the missing Clear method, List property, and read/write Column property aren’t the only shortcomings to the implementation of AddItem and RemoveItem in Access 2002. Performance is seriously flawed. Perhaps this will be fixed in a service pack, but using the original release of Access 2002 to run the sample application results in very noticeable delays when the controls are being filled by using AddItem. For this reason, be sure to test your application carefully before relying on these new methods in production code. Despite the poor performance of AddItem for populating lists, however, the expansion of the size of value lists in Access 2002 is a very welcome feature. With just a little effort, you can easily write your own list-filling code for value lists, using GetString, XML techniques, or simple string concatenation, and you now have a very viable alternative to relying on database objects as row sources. Although the controls in the sample application are unbound, you can use value lists with bound controls (ones that have control sources) just as effectively. In Access 2000, Microsoft made it possible for you to assign recordsets to forms, instead of setting the form’s record source. Now in Access 2002, you can assign a recordset to a combo or list box, instead of setting the control’s row source (you can also now assign properly shaped recordsets to Access reports). For the types of list-filling needs illustrated in the sample application, this is clearly the most suitable new technique to use, and you’ll find that it performs very well. Why bother with value lists when you can assign your recordset directly to the control? With this new capability, the only time you need to consider using a value list is if your data doesn’t lend itself easily to being gathered in a recordset. Public Sub LoadControlRst( _ ByRef ctl As Control, _ strSource As String, _ lngRowSourceCommandType As ADODB.CommandTypeEnum) On Error GoTo Handle_Err Const conProcName As String = _ "LoadControlRst" Dim strFile As String Dim cnn As ADODB.Connection Dim rst As ADODB.Recordset This code generates the name that will be used for the XML file: strFile = CurrentProject.Path & "\" _ & CurrentProject.Name & "_" & ctl.Name & ".XML"
& CurrentProject.Name & "_" & ctl.Name & ".XML"
Case 58 ' File already exists. You can use disconnected recordsets, as the sample code does. However, you can’t use recordsets that you create from scratch yourself. ADO enables you to create a new recordset, add field definitions to it, and then add rows of data, without ever connecting to a data source. This type of recordset can’t successfully be assigned to an Access list control. If you’re composing list data in code without ever making a connection to a data source, that would be a good place to use a value list. List controls have always been among the most useful features in Access, and in Access 2002 they get even better. Value lists now can hold up to 32K characters, not the measly 2K that was supported previously. New AddItem and RemoveItem methods make it easier to edit value lists, but test their performance in your application carefully before you rely on them. You can also now fill a list control simply by assigning a recordset to the control’s new Recordset property. One application of these new techniques is to build forms that don’t require persistent connections to a database in order to display lookup data.